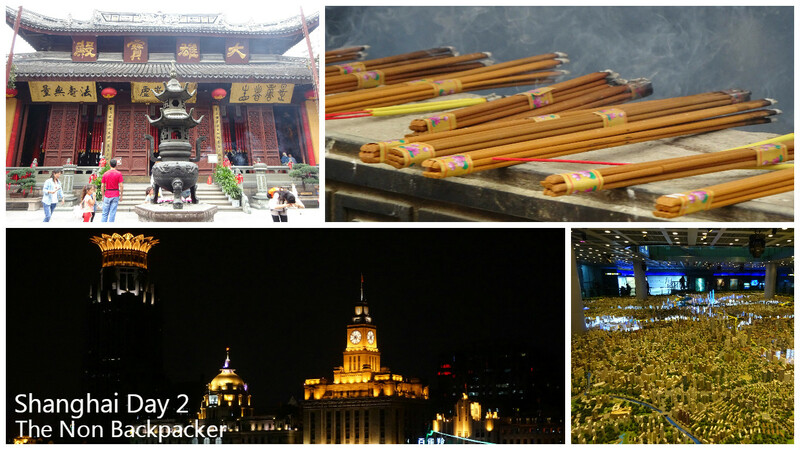 Check out our first day in Shanghai. On to day 2. After a quick breakfast in the hotel it was off to the bus stop again, after picking the green line and helping some German tourists with the difference between their leaflet for one company and the fact they were standing at the stop for a different bus company we were on our way to the Jing’an Temple. On the bus..check out the red headphones! 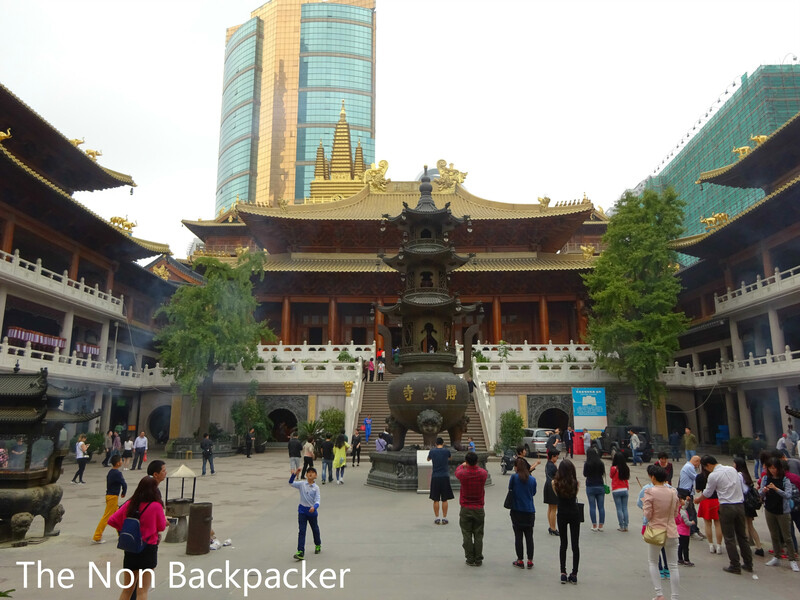 The Jing’an Temple is a well known temple and has been built, destroyed, built again, moved, burnt down and rebuilt many times in its 780 year history. It’s welcome rest from the modernness of Shanghai despite being centred in an area full of skyscrapers and modern buildings which does make for some great photos. 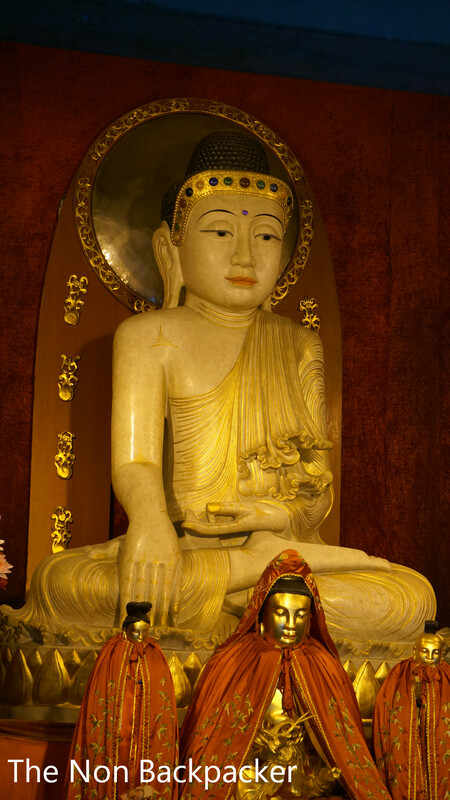 The temple itself was beautiful with incense burning and rooms with Buddhas to sit and worship at. 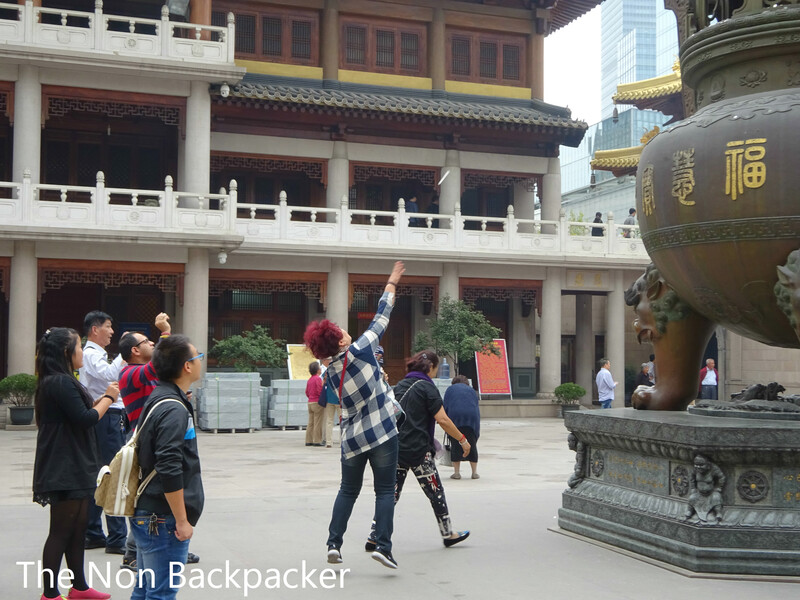 There was a nice compromise of worshippers and tourists. I’m sure there was more to it as there were lots of “normal” looking rooms with people gathered round but I have no idea what they were doing/what they were there for. 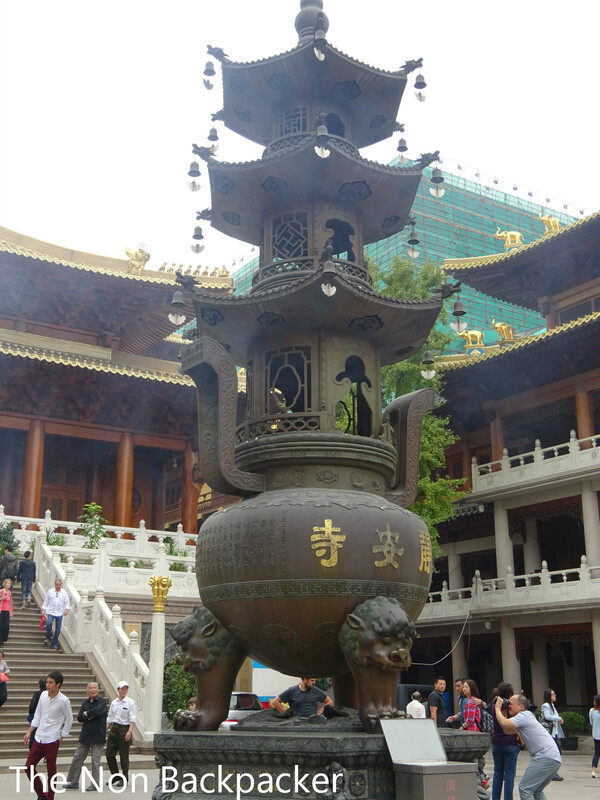 We walked around the central courtyard where there was a lucky stone and a giant incense burner that people were throwing money at. We worked out it must be lucky to get the coin to balance or fall into the burner. It was a bit lethal as no one seemed to have any regard for where anyone else was standing! There were some renovations happening which did give some areas a weird atmosphere but it was enjoyable nonetheless. 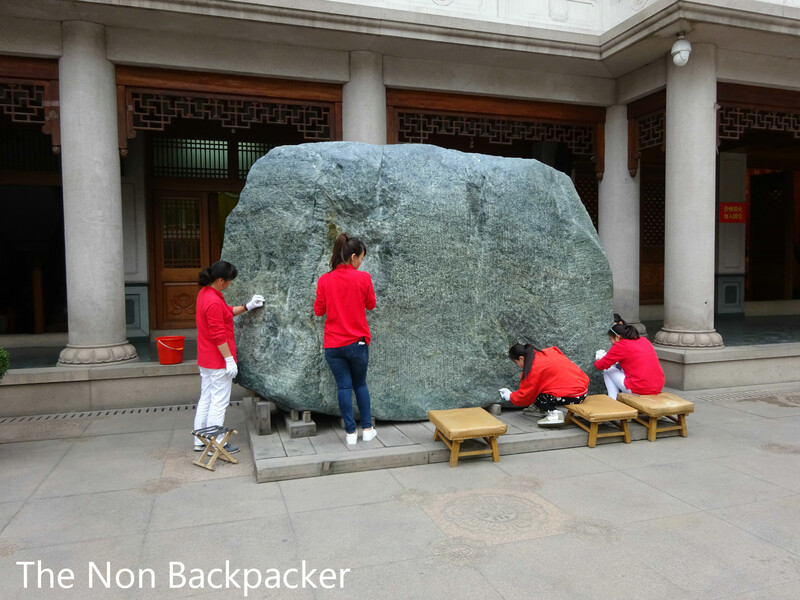 I would definitely recommend checking it out if you’re in Shanghai. 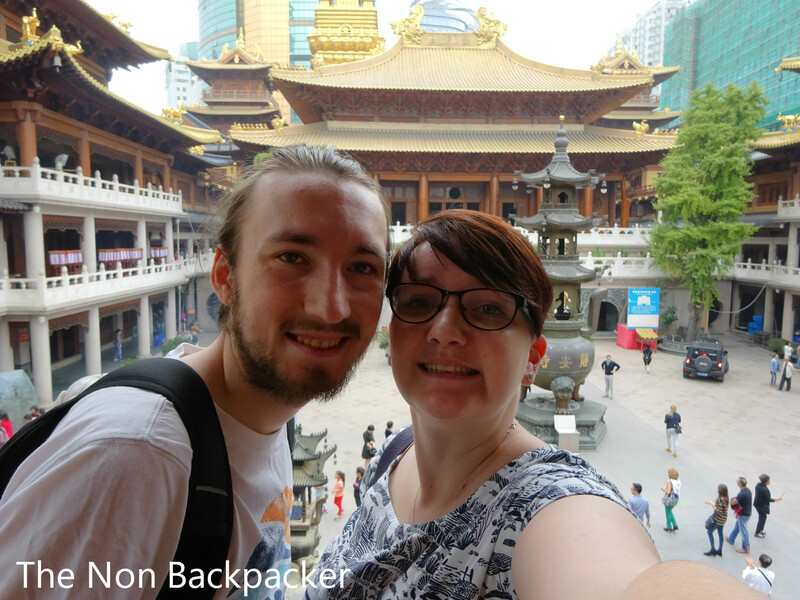 Our next stop was another temple, the Jade Buddha Temple which was a short bus ride away. The most irritating thing about the Big Bus Tour was the sheer amount of time you had to wait for the buses. They claim they come once every 30 minutes but I find this very hard to believe as we spent a lot more time waiting. 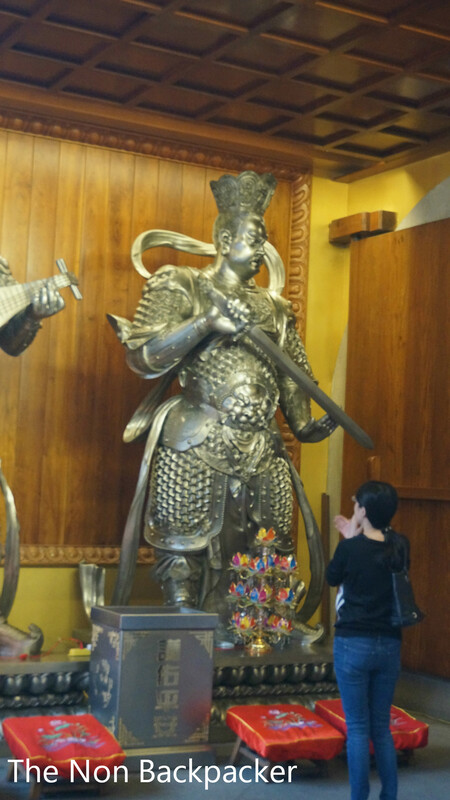 Anyway, we made it to the Jade Buddha Temple. 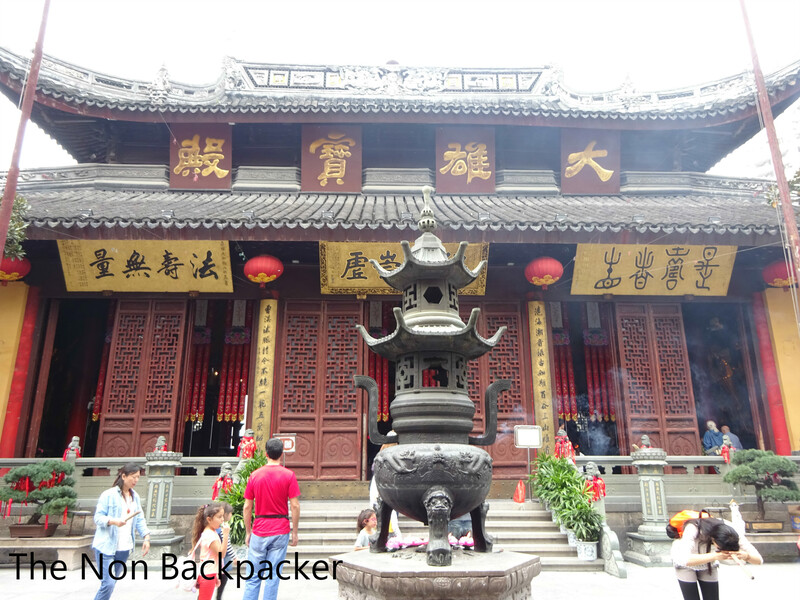 It’s smaller than the Jing’an temple and younger as it was originally built in 1882. 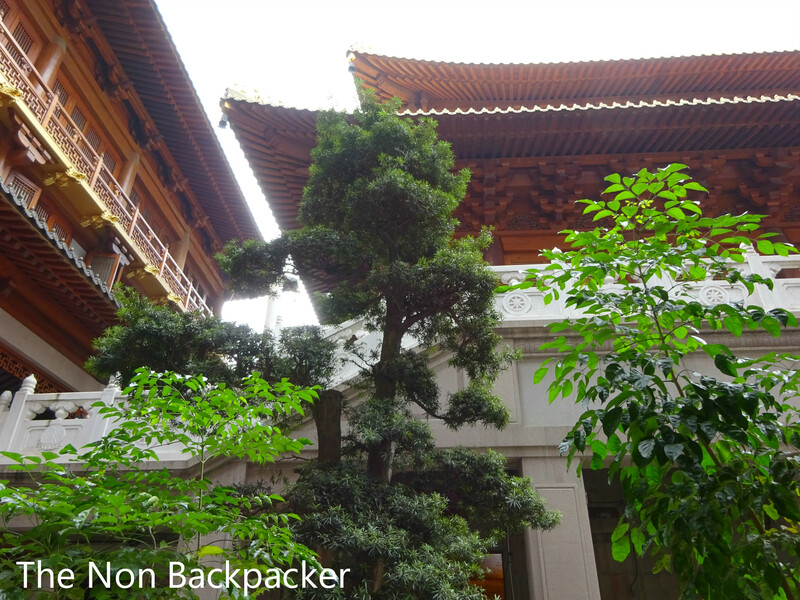 Again there was a central courtyard with incense burners and halls off the side with statues of Buddha. There were again many people praying and may just there for the tourism. 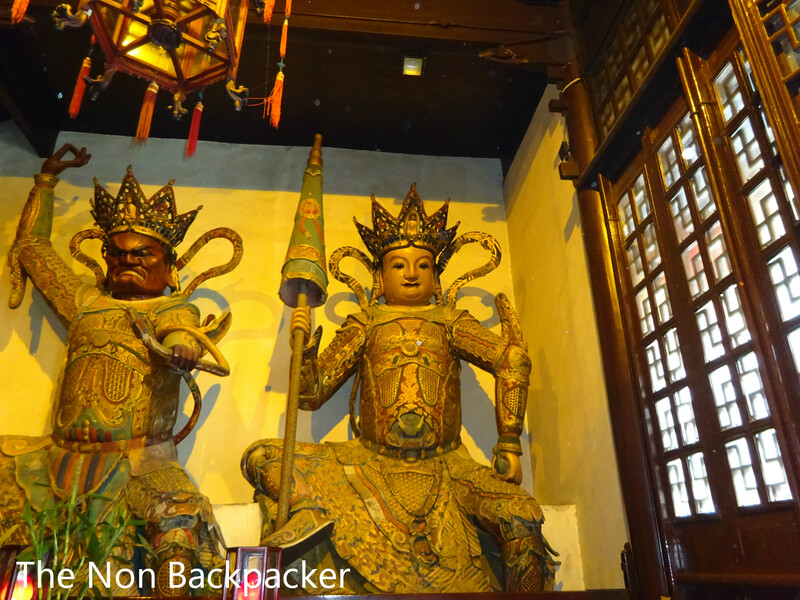 We walked around (trying to avoid the huge tour groups) and admired the work of the carvers. We headed up to the star of the show the Jade Buddha (pictures weren’t allowed) which was stunning. 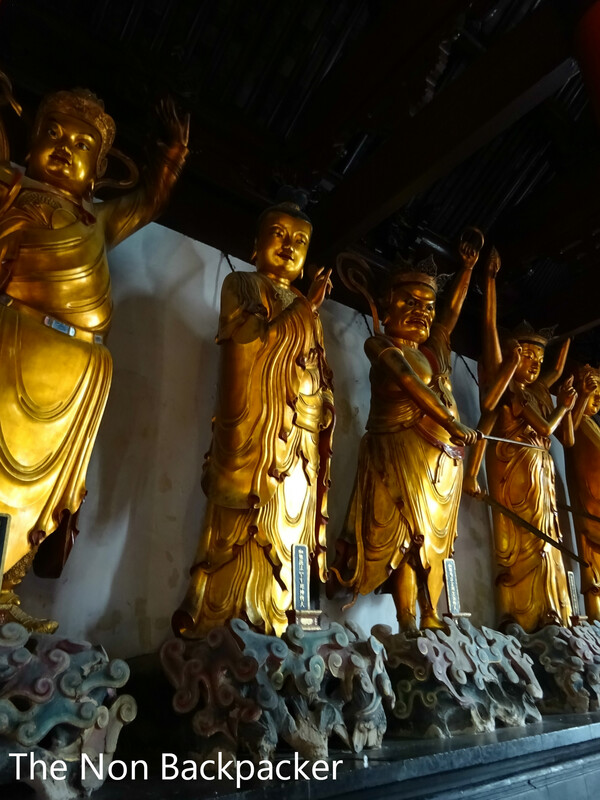 The Jade Buddha was carved beautifully and was surrounded by hundreds of small gold versions of the buddha. 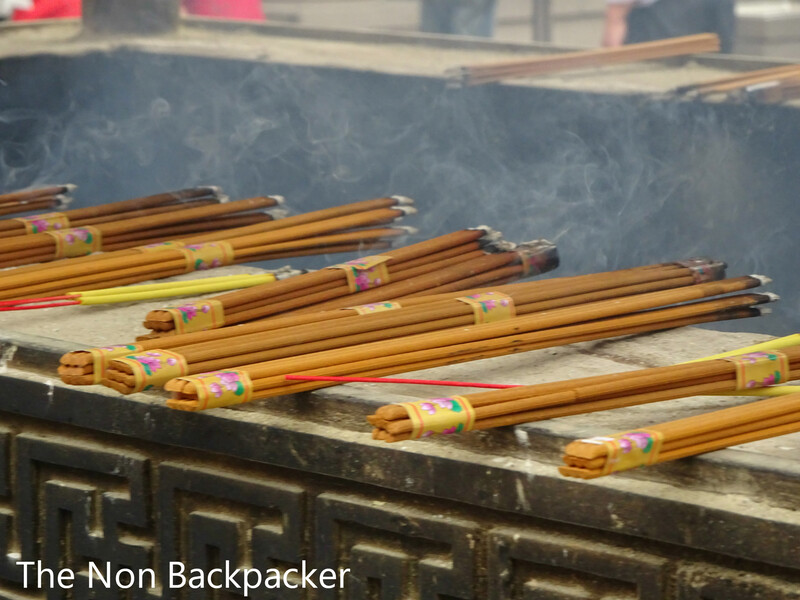 People were paying money to be given some liquid which they prayed with and then passed back to the attendant who poured it into huge pots with candle wick in them. 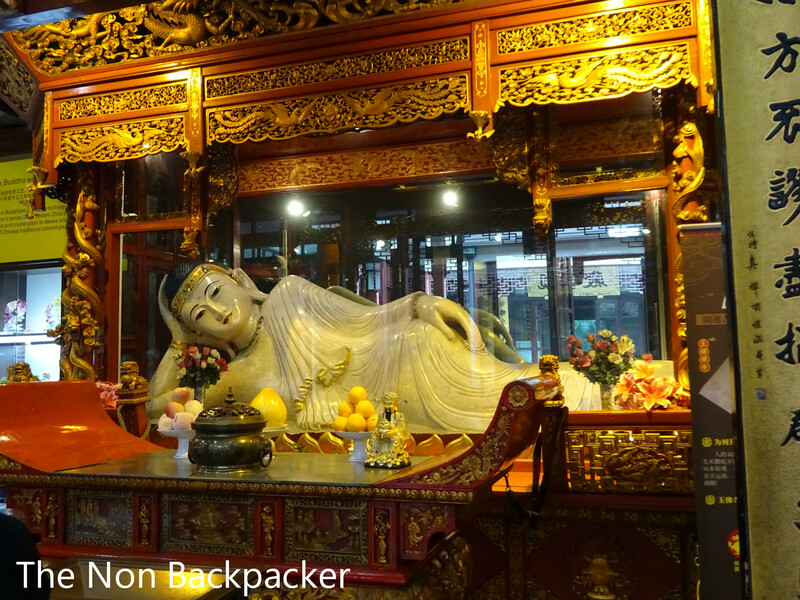 We headed back downstairs to see the reclining Buddha which was located in the middle of a shop. Odd. We did try to buy a stamp with our surname carved into the bottom but the man in front of us kept adding additional ones to his order (started with 2 then became about 10!) We got fed up waiting so walked out. Slight regret especially as we then had to 45 minutes for the bus to turn up but hey ho! You live and learn. 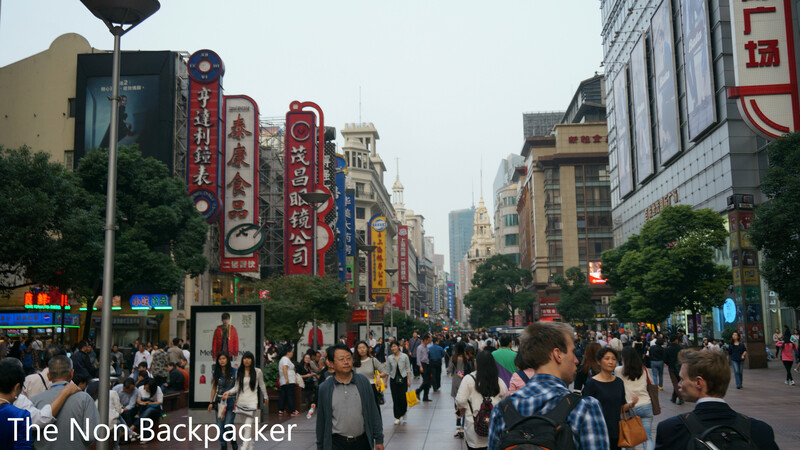 Our immediate desire was for some lunch so we got the bus to Nanjing Road and wandered down into the pedestrianised shopping street heading for a building called Food Market. On one of the upper floors was a selection of restaurants, we picked one with a picture menu and set about ordering (too much) food. We got, chicken with ginger (which came out cold, odd), braised pork leg, a selection of snacks (e.g. 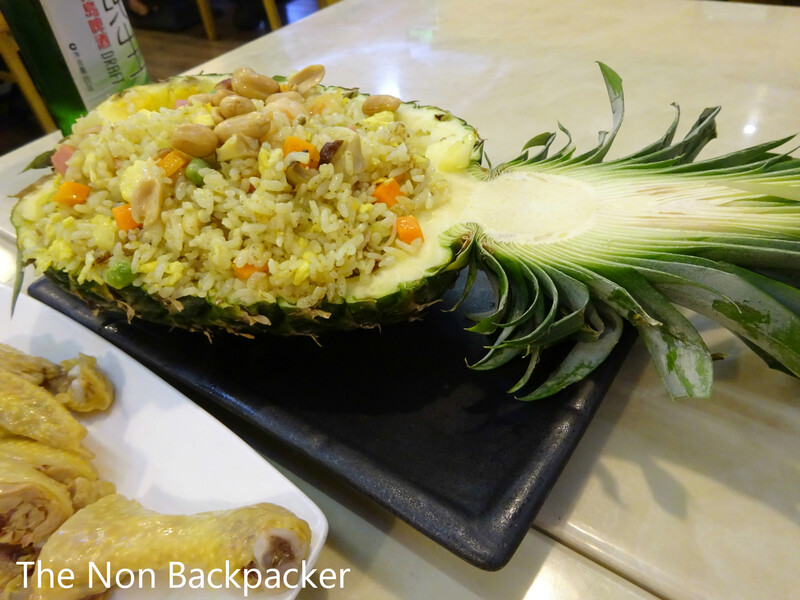 spring rolls) and pineapple fried rice – which came served in half a pineapple!!!! Full to the brim our next stop was the Urban Planning Exhibition Hall. 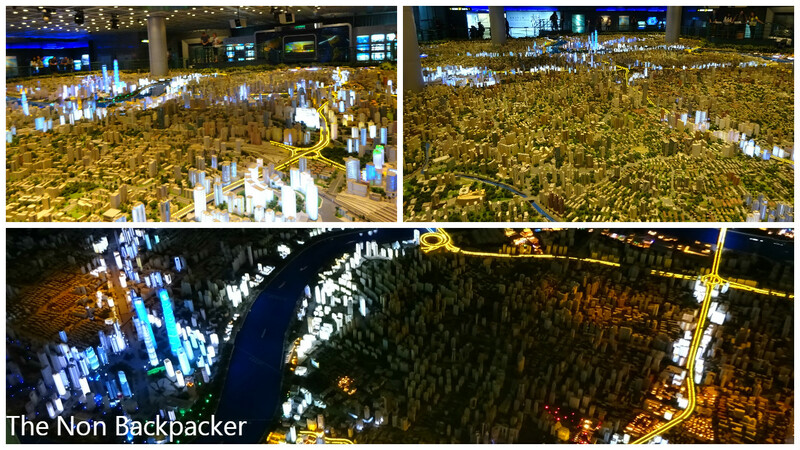 Yes I know it sounds lame…but…it has a scale model of Shanghai. 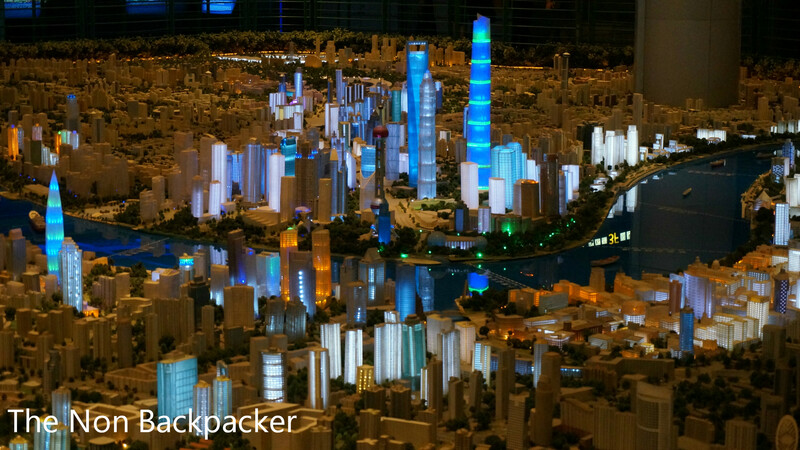 A SCALE model of Shanghai. Okay some of you may still think it’s lame but we really enjoyed it. There were lots of other exhibitions there but we mainly checked out the large model and the escalators that sped up when you stepped on them. Next came a map reading/scale fail. 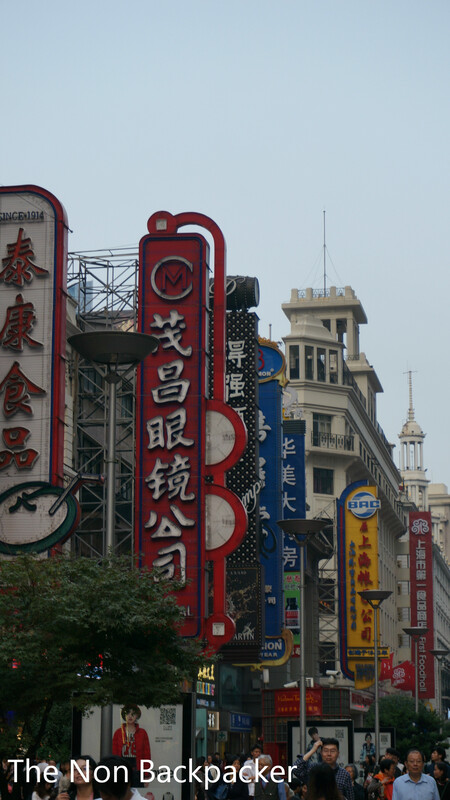 It looked as though the metro for Nanjing Road East was only a short walk away along Nanjing Road. We were wrong it was pretty much the entire road away (the whole road is 3.4 miles but I am pretty sure we did half of it at least). It doesn’t sound like much but when you are a) still jet lagged and b) been on your feet all day it does make for some tension. On my part anyway. Once back at the hotel we had a break and rested our feet before wandering back down to the river for our free river cruise which came as part of the bus tour tickets. It was a pain to find as it was really signed posted that clearly. The cruise was good, despite there being no seating and lots of pushy Chinese people trying to get the best selfies. 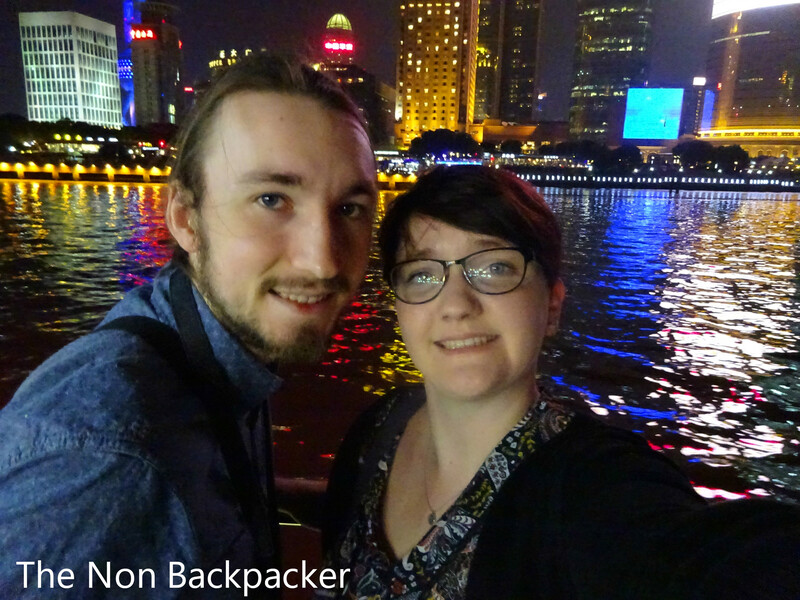 It was about an hour and did a loop down the river taking in the best sites from the Pudong and the Bund area. An action packed day that involved lots and lots of walking but we did everything we wanted to despite being tired so that was a plus. 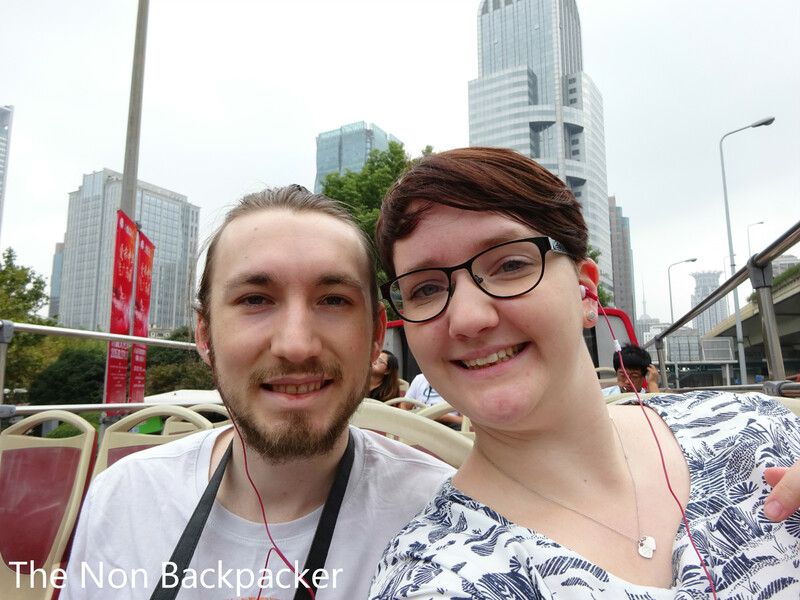 The only additional thing I would add if I have another day would be a visit to the Shanghai Museum and Xin Tian Di area but overall it was great! 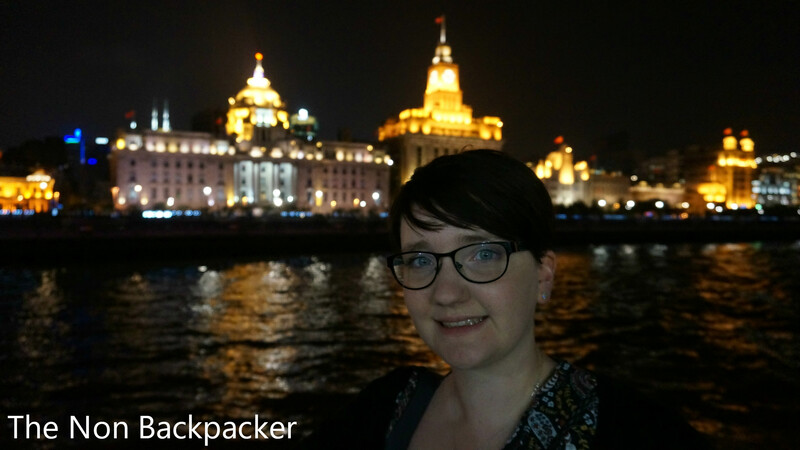 Next up is a high speed train to Beijing and three days filled with the sights of Beijing and an epic hike across the Great Wall!! Have you been to Shanghai? Have we missed anything? What did you think was the best site to see? Amazing impressions. 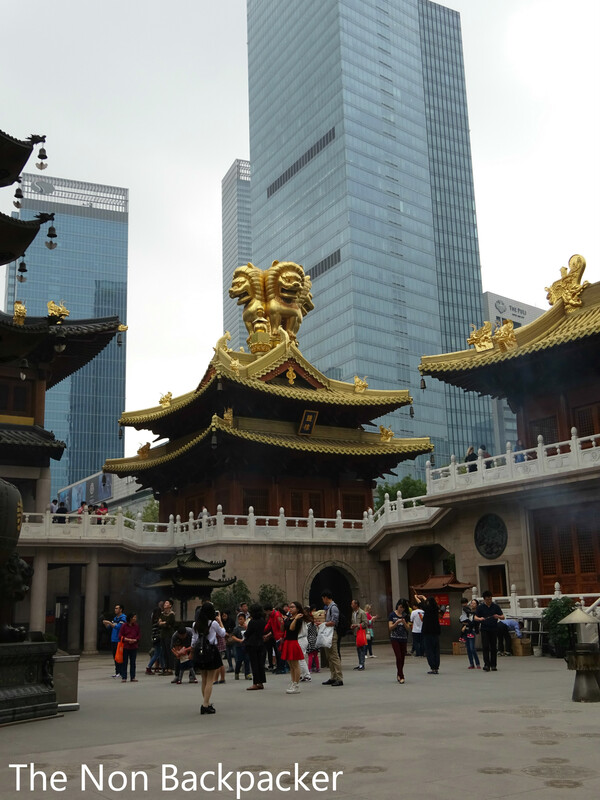 Shanghai is such a fascinating city! It really is and it’s changing all the time! From a fishing village in the south of China to a mega city in only a few decades!!! 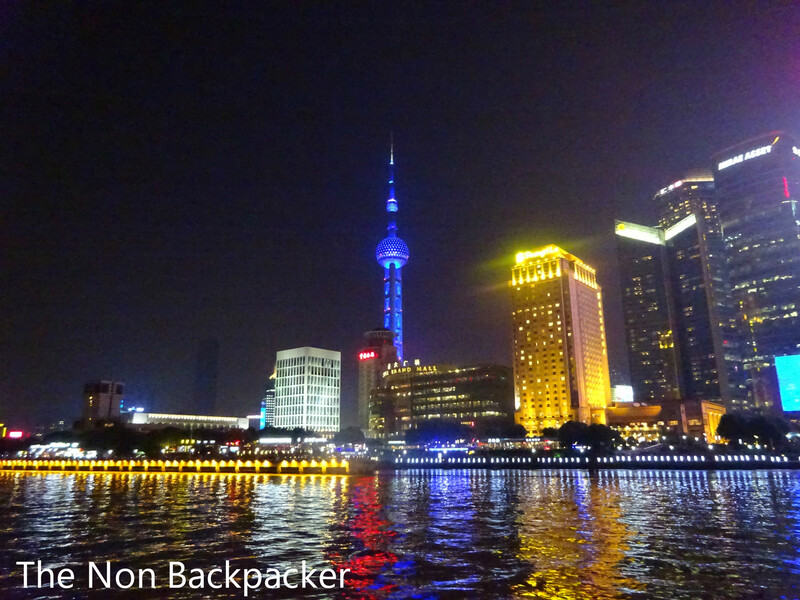 I as gutted to not get to go up the new Shanghai Tower so would love to go back to do that!